Welcome to nature amidst a carefully designed environment made of glistening snow crystals � rebuilt every season from 3000 tons of snow at six locations in the Alps and the Pyrenees. A vivid product for exciting events and one of the most innovative hotel concepts of our times � CO2-neutral and sustainable. A memorable experience awaits you! Spending a night here is something special. Something that people will frequently ask you about, and which you will enjoy recounting. Our expedition sleeping bags guarantee a warm night's sleep. Our Romantic igloos are laid out with lambskins and designed by international artists. Each is different, perfect for flirting and special moments. Depending on the location, a whirlpool or a sauna are also included in the igloo village. Our guides look after the wellbeing of guests and pamper them with homemade mulled wine and a traditional cheese fondue. Of course, activities are always dependent upon the respective weather conditions at the time. Overnight stays are possible from 25 December until around the middle of April. 6-bed igloos for families, companies and clubs. The expedition sleeping bags are designed for temperatures of up to -30�C � thus also keeping children and cold-sensitive guests warm. 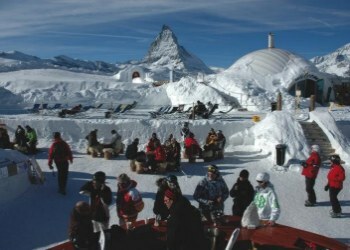 In case of large groups planning an overnight stay in a standard igloo, please directly contact the booking office. The number of standard sleeping places can be increased, depending on the location and date. 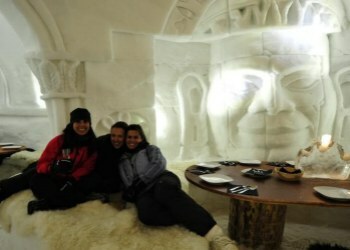 The exclusive experience Romantic Igloo in an impressive design. Your own private bathroom increases your privacy.